Bad quality transmission (on older models) but other great features! Our Dodge caravan is an older model and fairly simple. Cons would be that, like most Dodge older models, it needed a new transmission before it hit 160, 000. Pros would be that all of the back seats disappear into the floor. . . No more taking out seats! Say hello to extra space! So convenient for traveling. The double power sliding doors are another great feature for those who often have full hands (like parents!). It gets an average of 19 mpg and we love the head and leg room. Oh, and the car seats not only buckle in, but latch in with the metal hooks, making them twice as secure. Reliable and low cost of maintenance. I have had good results from my caravan. The only problem has been that I ran over a deer and one feral hog. Both destroyed the front end of the vehicle. I have spent very little on it except to go through several alternators. I discovered that they are Japanese made and cannot be rebuilt as mos. alternators can at a much smaller cost. Other than that it has been a good vehicle and I intend to keep it for another year at least. I keep the oil changed regularly and add a quart of Lucas oil on each change. We have taken several enjoyable vacations in it. Good value for travel, has good gas mileage, comfort and room. Have not had any issues. Performance is what I expect of a van. Have been on many road trips and find that the driver's seat is comfortable. Third row seats need work as they do not offer much comfort for adults but are great for kids. Have a/c for all seating rows wish that controls were located in the seating rows instead of the front and center areas of van. Stow and go not as easy as it seems, but is nice in that you do not remove seats. Extra storage under floor when seats are used and not stowed. . Large knobs for ease of tuning a/c and radio. MAXZONE IS RECALLING 2,520 HEADLIGHT ASSEMBLIES, DEPO BRAND, P/NOS. 3341103L-AS AND 334-1103R-AS SOLD FOR USE AS AFTERMARKET EQUIPMENT FOR 2001-2007 DODGE CARAVAN PASSENGER VEHICLES. THESE HEADLAMPS FAIL TO CONFORM TO THE REQUIREMENTS OF FEDERAL MOTOR VEHICLE SAFETY STANDARD NO. 108, LAMPS, REFLECTIVE DEVICES, AND ASSOCIATED EQUIPMENT. MAXZONE WILL NOTIFY OWNERS AND OFFER REIMBURSEMENT FOR ANY NONCOMPLIANT HEADLIGHTS. THE RECALL IS EXPECTED TO BEGIN ON OR ABOUT JUNE 16, 2008. OWNERS MAY CONTACT MAXZONE AT THE FOLLOWING LOCATIONS: 1-888-286-1188 (WA, OR, CA, ID, NV, AZ, MT, WY, UT, CO, KS, NM, OK, TX, AR, LA, AK, HI) 1-877-253-8930 (ME, NH, VT, MA, CT, RI, NY, NJ, PA, MD, DE, WV, VA) 1-800-859-4755 (NC, SC, GA, FL, TN, AL, MS) 1-866-783-6858 (ND, SD, NE, MN, IA, MO, WI, IL, MI, IN, OH, KY). EAGLE EYES IS RECALLING 11,534 HEADLAMP ASSEMBLIES, P/NOS. CS090-B001L AND CS090-B001R, SOLD FOR USE AS REPLACEMENT EQUIPMENT FOR THE ABOVE LISTED PASSENGER VEHICLES. THESE HEADLAMPS FAIL TO CONFORM TO THE LOWER BEAM PHOTOMETRY REQUIREMENTS OF FEDERAL MOTOR VEHICLE SAFETY STANDARD NO. 108, "LAMPS, REFLECTIVE DEVICES, AND ASSOCIATED EQUIPMENT." EAGLE EYES WILL NOTIFY OWNERS AND OFFER REPLACEMENT HEADLAMPS FREE OF CHARGE. THE RECALL IS EXPECTED TO BEGIN DURING AUGUST 2008. OWNERS MAY CONTACT EAGLE EYES AT 1-800-568-1098. ON CERTAIN VANS AND SPORT UTILITY VEHICLES, THE FRONT WINDSHIELD WIPER MOTOR ARMATURE SHAFT MAY BREAK. DURING CERTAIN OPERATING CONDITIONS, LOSS OF FRONT WINDSHIELD WIPING CAPABILITY COULD OCCUR, AND THE DRIVER'S VISION COULD BE OBSCURED WHICH COULD RESULT IN A CRASH. DEALERS WILL INSPECT AND REPLACE THE WINDSHIELD WIPER MOTOR FREE OF CHARGE. THE RECALL BEGAN ON JUNE 19, 2006, TO DODGE DURANGO OWNERS. MINIVAN OWNERS WILL BE NOTIFIED DURING JULY 2006. OWNERS MAY CONTACT DAIMLERCHRYSLER AT 1-800-853-1403. 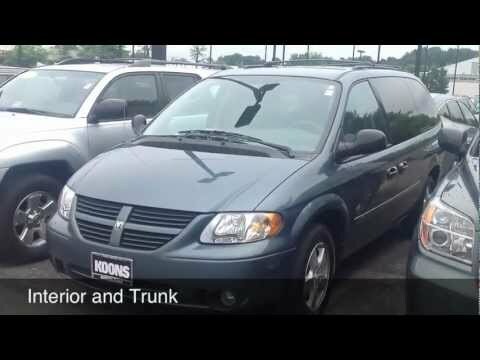 CHRYSLER IS RECALLING CERTAIN MODEL YEAR 2005-2006 DODGE CARAVAN, GRAND CARAVAN AND CHRYSLER TOWN & COUNTRY VEHICLES ORIGINALLY SOLD IN OR CURRENTLY REGISTERED IN THE STATES OF CONNECTICUT, DELAWARE, IOWA, ILLINOIS, INDIANA, KANSAS, KENTUCKY, MASSACHUSETTS, MAINE, MARYLAND, MICHIGAN, MINNESOTA, MISSOURI, NEBRASKA, NEW HAMPSHIRE, NEW JERSEY, NEW YORK, NORTH DAKOTA, OHIO, PENNSYLVANIA, RHODE ISLAND, SOUTH DAKOTA, TENNESSEE, UTAH, VERMONT, VIRGINIA, WEST VIRGINIA, WISCONSIN, ALASKA AND THE DISTRICT OF COLUMBIA. THE FRONT CRASH SENSORS MAY CRACK UNDER CERTAIN ENVIRONMENTAL CONDITIONS AND ALLOW WATER TO ENTER INTO THE SENSOR. THIS CAN CAUSE THE SENSOR TO BECOME INOPERATIVE AND ILLUMINATE THE AIRBAG WARNING LIGHT. THESE SENSORS WERE ADDED TO ENHANCE THE PERFORMANCE OF THE AIRBAG SYSTEM IN CERTAIN FRONTAL CRASHES. IF THE FRONT CRASH SENSORS BECOME INOPERATIVE, THE DRIVER IS IMMEDIATELY ALERTED BY ILLUMINATION OF THE AIRBAG WARNING LIGHT AND THE VEHICLE SHOULD BE PROMPTLY SERVICED. UNTIL THE VEHICLE IS REPAIRED, THE AIRBAGS MAY NOT PROVIDE THE ENHANCED PROTECTION IN THE EVENT OF A CRASH. CHRYSLER WILL REPLACE THE FRONT AIRBAG SENSORS WITH A NEW DESIGN. THIS SERVICE WILL BE PERFORMED FREE OF CHARGE. THE SAFETY IMPROVEMENT CAMPAIGN WILL BEGIN DURING JUNE 2010. OWNERS MAY CONTACT CHRYSLER AT 1-800-853-1403.